Long story short: a flaky scalp is embarrassing. Flakes are even more embarrassing when you're getting your hair done at a fashion event and your flakes are everywhere! Luckily, I bemoaned my horrid scalp issue with Julia when she stopped by my hair chair to say Hi, and the Phyto love began. Julia's family has similar skin issues, so she knew just what brand works. And Phyto, people, WORKS. I will post later about their shampoos and other products, but today I must wax poetic about Phyto's botanical scalp treatment. When the seasons change, my scalp gets very flaky, and with this spring's mercurial weather I've been suffering a seriously dry scalp. 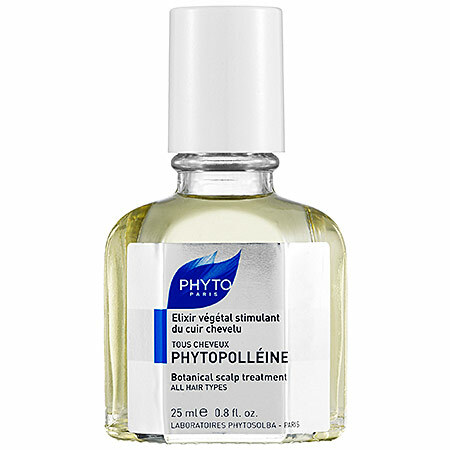 But the Phytopolléine, above, has remedied my scalp issues: no more flaking and no more itching. Also, and this is very important to me in all my skin and haircare products, Phyto formulas have a big percentage of botanicals and no parabens, formaldehyde, petrochemicals, etc. A big bonus to using Phyto's scalp treatment? According to the product reviews on Sephora's site, many women experienced less hair breakage and stimulated growth (Phyto recommends using this in tandem with their Phytolium 4 for severe hair thinning). I was gifted this product by Phyto, but this scalp treatment's efficacy and purity will keep it permanently on my bathroom shelf. Find it at Sephora on 34th Street, and say adieu to flakes and itchy scalp!